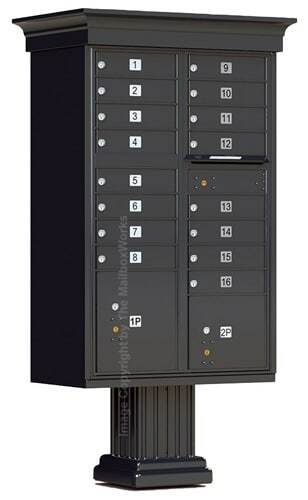 The Vogue 8 door Classic CBU mailboxes 4 parcel lockers is the perfect way to enhance your cluster box units by Auth Florence Manufacturing. 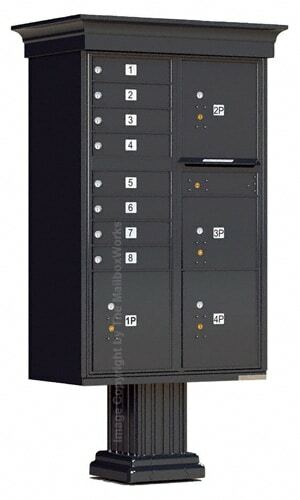 Economical and easy to install, these CBU mailbox accessories include an aluminum pillar, base and cap, ideal for use on CBU residential, industrial and Commercial Mailboxes. 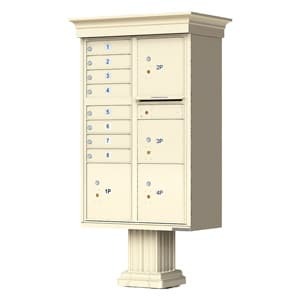 Auth Florence 8 door Classic CBU mailboxes 4 parcel lockers are made of 100% die cast aluminum with quick install self-tapping screws. Stylish Cast Aluminum CBU Roof Cap looks like crown moulding and is easily secured directly on top of the CBU mailbox unit. The Square Post Column and Base wraps around the existing pedestal offering reinforced design and appeal. Free-standing Auth Florence CBU mailboxes offer the safest and most secure access to mail from one central location. 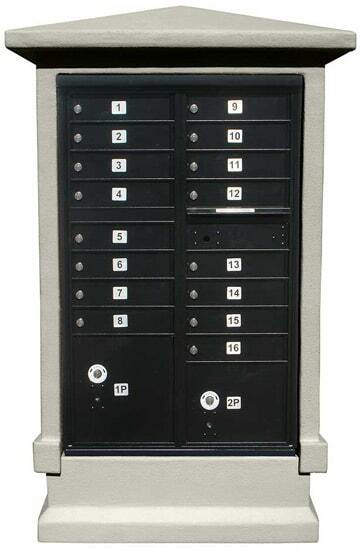 Fully licensed by USPS the cluster mailboxes and pedestal are constructed from solid aluminum and stainless steel. 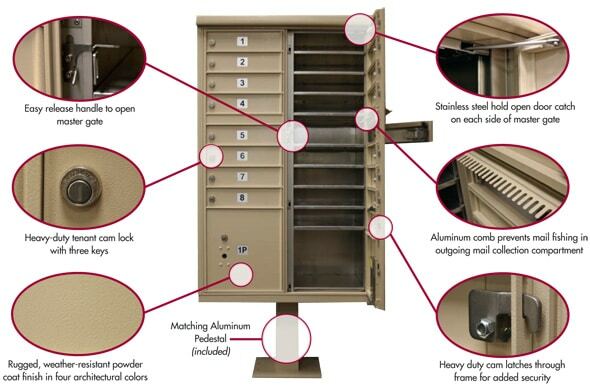 All incoming and outgoing mail delivery is protected by interlocking and overlapping seams on master front loading door and an integrated welded cabinet; hood seams resist unlawful prying. CBU mailbox construction also includes wrap around 360 degree stainless steel hinges, welded seams, hold-open door catch and easy release handle for master gate. Each 8 door cluster box unit by Florence Manufacturing features four parcel lockers and one integrated outgoing mail collection compartment. Choose from one of four rust-proof color finishes that stand up to tough forces. 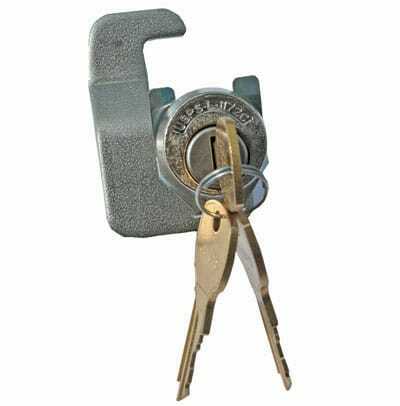 3 keys per door provide tenants with convenient access to their own mail compartment plus key trapping lock on parcel lockers provides easy key return. 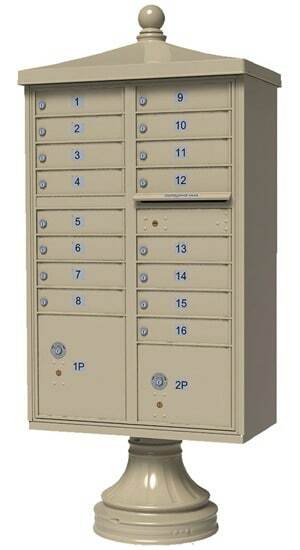 Order with stock silver door numbering options or upgrade to one of MailboxWorks’ three custom engraving options. View the “Tenant Door Identification” drop down menu for more information. Custom Silver Decals can have up to 6 7/8″ characters; USPS recommends up to 3 characters. Custom engraving can have up to 12 3/4″ characters and has black or white color fill options. 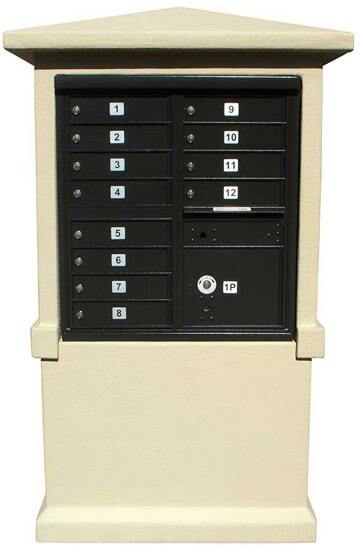 When you are ready to purchase 8 door Classic CBU mailboxes 4 parcel lockers, please feel free to ask us for help. Call us or chat with a customer care rep if you have any questions. Standard Compartments 3.25" 12.875" 16.75"
Outgoing Mail Compartment 3.25" 12.875" 16.75"
Small Parcel Compartment 10.25" 12.875" 16.75"
Large Parcel Compartment 13.75" 12.875" 16.75"
When selecting the options for your CBU mailbox you will see we offer “Professional Mailbox Installation”. Three choices for installation are offered to make your experience complete for all your CBU mailbox needs. Option A – Installer uses existing anchor bolts to mount pedestal. Choose this option if you have existing cluster mailboxes that have anchor bolts that are secure and in good condition and match the footprint of the new cluster mailbox. 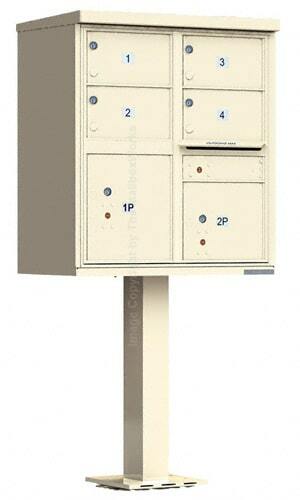 The installer will then bolt the new mailbox pedestal to the existing anchors and mount the mailbox to the pedestal. Option B – Installer secures pedestal to new anchor bolts in existing concrete. Choose this option if you have a concrete pad that is in good condition and does not have anchor bolts. The installer will install the new wedge stud anchor bolts, install the pedestal, and mount the CBU mailbox. Wedge stud anchor bolts can be purchased from The MailboxWorks with your CBU. Option C – Installer replaces existing anchor bolts. This is like Option B except that the installer will remove the existing anchor bolts first and then install the new wedge stud anchor bolts. You are replacing an older CBU or NDCBU where the new cluster mailbox pedestal cannot mount to the existing anchor bolts. Any other reason where the cluster mailbox pedestal cannot be installed onto the old anchor bolts. What is included with the mailbox installation? Installing the pedestal onto the existing concrete pad covered by one of the options above*. Securely mounting the CBU mailbox on top of the pedestal. Do you offer installation in my area? YES, unless you are outside the continental US. We provide installation services for The MailboxWorks customers in the 48 states of the continental US. 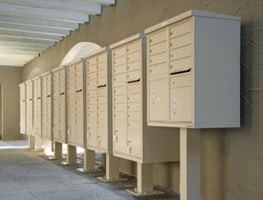 Are your mailbox installers insured and licensed? YES, our professionals are insured and licensed. Can my existing cluster mailbox be taken away? 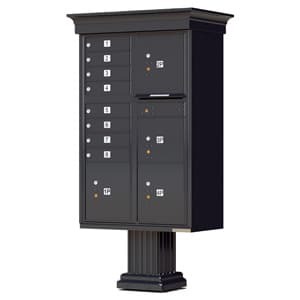 When you are replacing an existing CBU mailbox (pedestal cluster mailboxes) we can arrange to have the installer remove the old CBUs from the job site. We do need to be notified in advance of the installation. There is a charge of $100.00 in addition to the installation service for removal of the existing CBU cluster mailboxes. Can the installer apply number decals that were ordered loose? NO, unfortunately you would need to apply any number decals that were ordered loose and not already applied to the cluster mailbox. This is a rare occurrence because number decals are standardly applied to Florence CBU cluster mailboxes. An alternate brand, if ordered, can have decals come loose or if the customer specifies loose decals at the time of ordering. How do I know if Option A, Installer uses existing anchor bolts to mount pedestal, will work for my cluster mailbox installation? Measure the distance from left to right using the center of one bolt to the center of the other bolt and verify it measures 10”. Then measure the distance from front to back using the center of one bolt to the center of the other bolt and verify it measures 4”. (see pictures) If those measurements agree and the bolts are in good condition then Option A should work for you. Will the installer provide anchor bolts for my cluster mailbox? NO, you would need to make the anchor bolts available. If the cluster mailbox is being installed on existing anchor bolts you are all set. Otherwise make it easy and purchase the anchor bolts with your CBU mailbox. 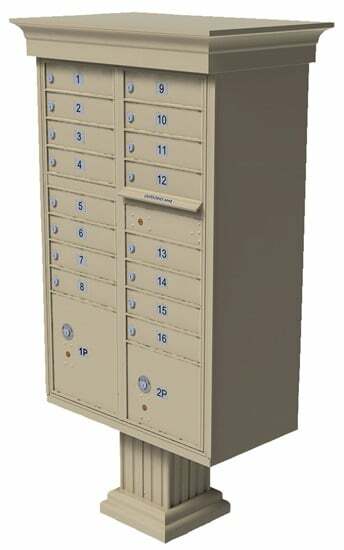 If other supplies to secure your cluster mailbox are needed, the installer may be able to provide these at an additional charge. Does The MailboxWorks coordinate the installation with the installer? YES. Before the appointment we coordinate with the installer. We will contact you to coordinate an installation schedule. Also, the schedule will be confirmed again just prior to the installation along with any pertinent details. The customer would be responsible for meeting with the installer at the scheduled installation appointment. After your install is complete you will receive all the keys for the tenant mailboxes from the installer so that you can hand them out to residents. Why should I order professional installation service from The MailboxWorks? A mailbox specialist from The MailboxWorks helps you from the moment you place your order until the installation is complete. We will communicate with your local post office and the professional installers and ensure everything is coordinated. Installing a CBU mailbox can be a complex process. From knowing how to securely mount the cluster box unit to having the USPS come out and install their locks, the steps can be involved. Our professional installers and The MailboxWorks specialists make the process a snap. *The customer is responsible for ensuring that the location for the installed CBUs meet the USPS requirements. 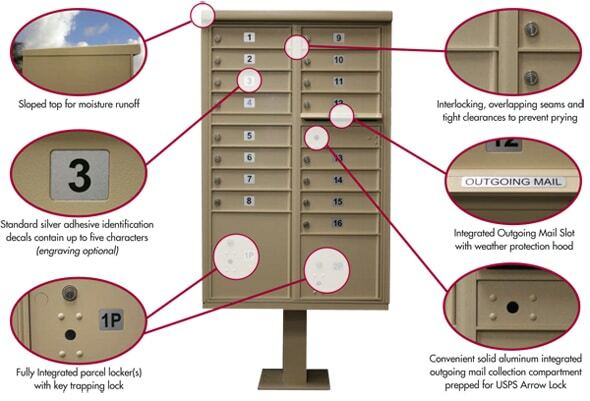 Customers should contact their local Postmaster and review the location and any requirements before the installation of the cluster mailboxes at your location. Whether you are installing your new CBU mailboxes yourself or having our professional installers do it, we offer two types of anchor bolts as well as optional vandal proof nuts for your cluster mailboxes. L-Bolt Anchors are used when new concrete pads are being poured for your cluster mailboxes. The L shaped anchor bolt is inserted into the wet concrete so that as the concrete sets the bolts are secured in place. If new concrete is being poured, the L-bolt is the best possible CBU mailbox anchoring option. This option comes with 4 stainless steel L-bolt anchors that are 7 inches by 2 inches, 4 washers, and 4 matching hex nuts. Wedge Stud Anchors are used when there is an existing concrete pad that is in good condition and meets postal approval for cluster mailboxes. A hole is drilled into the concrete and the anchor bolt is inserted. Then as the nut is tightened and the anchor is pulled up, the base expands for secure holding of your CBU mailbox. This option comes with 4 stainless steel wedge stud anchors that are ½ inch wide and 5 ½ inches long, 4 washers, and 4 matching hex nuts. Upgrade your installation hardware by including two optional tamper-resistant nuts to prevent your CBU cluster mailbox from being stolen. The nut is easily installed using a standard socket or wrench. The hex head breaks away upon tightening and leaves a non-removable cone. Tamper-resistant nuts install easily but are hard to remove. The set of 2 stainless steel tamper-resistant nuts should be installed kitty corner from each other in order to deter theft. This is an example of use of the tamper-resistant nuts used in another application.